Happy Friday, y'all! I hope you've had a great week! We have an exciting weekend coming up around here because my oldest daughter turns eight on Saturday! I seriously can't believe that I will have an eight year old tomorrow. Time flies by so fast! Julianna is a fashionista in the making herself. She is a smart leader who loves the stage, enjoys being creative, and will always speak her mind. Our "lucky charm" is definitely something special and I am so proud to be her momma! We are celebrating her by letting her getting her hair done, going to a paint class with her sister, and then getting her ears pierced. She seriously couldn't be more excited! 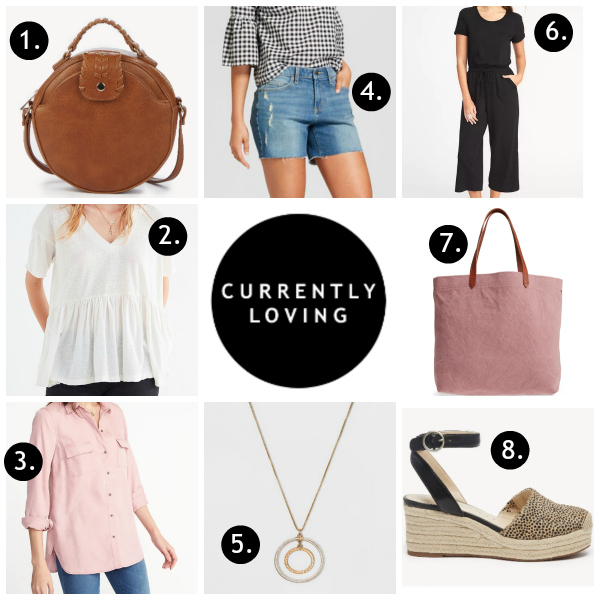 Today, I'm rounding up what I am currently loving this week. I am so happy for spring clothes, shoes, and accessories. It's my absolute favorite season to dress for! 1. Round Bag | I am obsessed with round bags! I just think they are so cute. I love this neutral colored one that you could carry year round! 2. Peplum Tee | I already own this tee in gray (I believe the gray is called black but it's definitely gray in person) and I absolutely love it. I styled it in this blog post and I've been wearing it nonstop since I got it. It runs a little oversized (which I love) so I stuck with my regular size. 3. Blush Shirt | I picked this shirt up during the most recent Old Navy sale and I can't wait to get it! I love anything made out of tencel. It's seriously the softest fabric! I sized up to a medium in this short for extra length. I plan to wear it as a "cardigan" over tees this spring. 4. Denim Shorts | I just got these shorts in the mail and I love them. They are the perfect shorts for moms or really any woman who doesn't want to wear booty shorts or shoes down to her knees. They are the perfect length with just the right amount of distressing. I sized up one size for the best fit. Also, they are currently on sale for $15! 5. Necklace | This great necklace was also featured in my 14 Piece Spring Capsule Wardrobe From Target post earlier this week. I love the mixed metals! You could wear this necklace with anything. 6. Jumpsuit | I also ordered this jumpsuit from the Old Navy sale. I saw it in store but they didn't have my size in the solid black so I scooped it up online as soon as I saw it was on sale. I think this would be so cute with a fun pair of espadrilles for spring! 7. Tote Bag | I love tote bags because I love being able to throw all of my stuff in one bag and out the door I go. I recently purchased this one to carry to work (and everywhere else). I love the color! 8. Espadrilles | How stinkin' cute are these shoes?! I really love everything about them and I think they would look adorable with that black jumpsuit. Thank you so much for visiting today! I hope you have a great weekend!